Will Hong Kong Ban Ivory Sales? Movement is afoot to crack down on one of the world's largest illegal ivory markets that's fueling the rampant slaughter of African elephants. 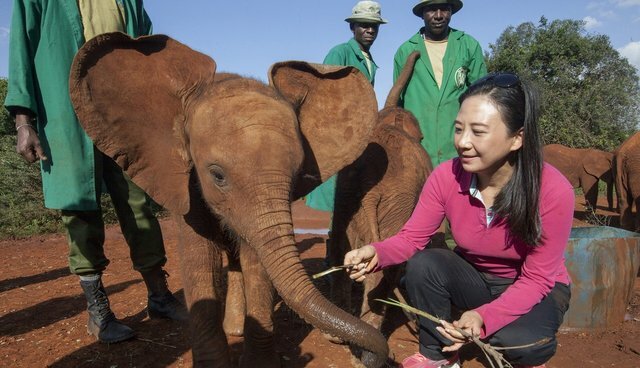 On Tuesday, Hong Kong legislative councillor Dr. Elizabeth Quat, a leading proponent for an ivory sales ban in China, formally announced her plan to seek a Hong Kong government ban on its domestic ivory trade. Hong Kong is a key market for illegal ivory, with an estimated 15 percent of the world's total ivory seizures made in the city in 2013. "Hong Kong would be the first consumer nation to ban ivory sales," Legislative Councillor Quat said. "We'd be taking a strong stand with our brothers and sisters in Africa and setting an example for the rest of the world." Quat also announced that she has been lobbying Hong Kong deputies to China's National People's Congress (NPC) to suggest a resolution banning the domestic ivory trade in mainland China, the world's largest ivory market. Quat told reporters that she had already secured the key support of Maria Tam Wai-chu, the convener of the 36-strong bloc of Hong Kong deputies to the NPC, for the suggested resolution to the NPC's Standing Committee. This follows a similar policy petition last year by former NBA superstar Yao Ming, a deputy to the Chinese People's Political Consultative Conference (CPPCC) and an active WildAid ambassador who has advocated worldwide for elephants, rhinos and sharks. During the press event held at Hong Kong's Legislative Council Building, Quat described her fact-finding trip to Kenya last fall, where she witnessed two sickening elephant poaching sites: Ol Donyiro and Sera, both located in central Kenya. She also met with rangers, conservationists and local people from communities affected by the poaching crisis. Quat linked the poaching crisis in Africa to the current situation in Hong Kong, where the government's ivory licensing system is rife with issues and the laundering of ivory into the so-called "legal" market is a very real concern. The government issues permits to Hong Kong vendors allowing them to sell ivory obtained prior to 1989 - a loophole that has provided cover for the sale of items made from recently poached elephants. "A ban is an important message that shows the Chinese government is very keen on protecting animals and the Sino-African relationship," Quat said. Quat hopes her recent trip to Kenya will raise awareness and help build momentum for further action in Hong Kong. "Coming to Africa and witnessing the realities of elephant poaching first hand has helped me understand the true implications of buying ivory," she said. "I hope I can share this awareness with the people of Hong Kong and help end the killing. Thus, I will work with WildAid and launch the 'Love Elephants' campaign in Hong Kong."